Benjamin was an eclectic thinker, combining elements of German idealism, Romanticism, historical materialism, and Jewish mysticism, He made enduring and influential contributions to aesthetic theory and Western Marxism, and is associated with the Frankfurt School. Among Benjamin's major works as a literary critic are essays on Goethe, Kafka, Kraus, Leskov, Proust, Baudelaire, and translation theory. He also made major translations into German of the Tableaux Parisiens section of Baudelaire's Les Fleurs du mal and parts of Proust's À la recherche du temps perdu. Benjamin committed suicide in Portbou at the French-Spanish border while attempting to escape from the Nazis. Philosoph, Literaturkritiker und Übersetzer (1892-1940). 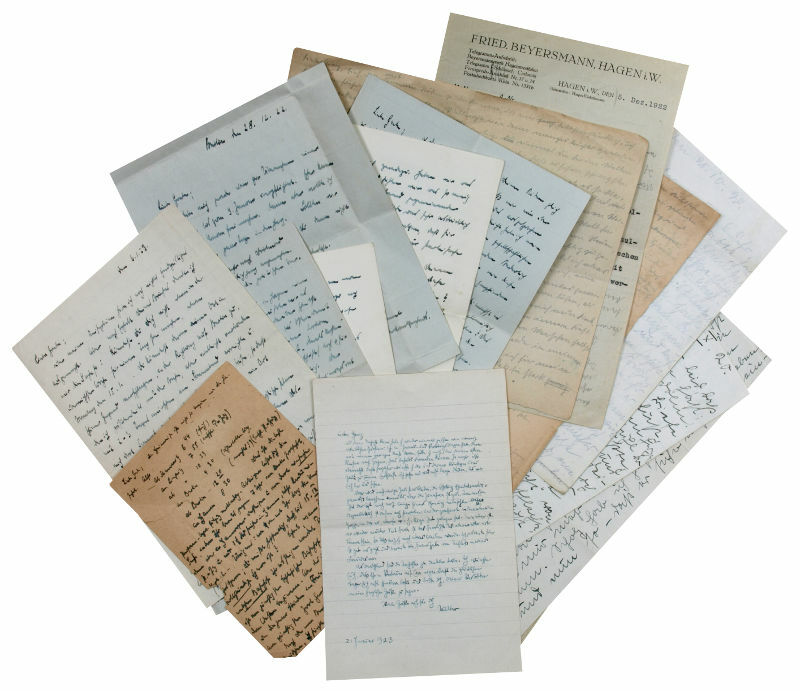 Collection of letters by Walter and Georg Benjamin as well as by third parties. Verschiedene Orte. Zusammen 39 SS. auf 23 Bll. Verschiedene Formate. Mit zwei Beilagen (s. u.). 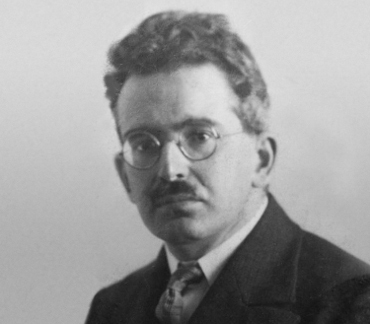 Comprehensive family correspondence centering around Walter Benjamin and his brother, the physician and later resistance fighter Georg, Georg's fiancée Grete Kliem, and her friend Lisabeth. The 18 letters and postcards highlight the ideological differences between the socialist Georg Benjamin, from wealthy Jewish merchant stock, and his bourgeois, conservatively Christian fiancée, which ultimately led to the couple's separation. Georg Benjamin, who was to be murdered at Mauthausen concentration camp in 1942, instead married Hilde Lange in 1926. The jurist Lange later served as minister of justice to the German Democratic Republic, earning her the name of "Bloody Hilde". - Walter Benjamin: 1) ALS. 21 Jan. 1923. 1 p. 8vo. To Georg. ALS by his wife Dora on reverse. - Georg Benjamin: 1) APcS. [22 Aug. 1923]. 2 pp. 8vo. With autogr. address. To Grete. 2) ALS. 6 Jan. 1923. 1 p. 8vo. To Grete. 3) ALS. Undated. 2 pp. 8vo. To Grete. 4) Autogr. lettercard signed. 16 Feb. 1923. 1 p. Oblong small 8vo. To Grete. 5) ALS. Undated. 1½ pp. 8vo. With autogr. envelope. To Grete. 6) ALS. Berlin, 28 Dec. 1922. 1 p. 8vo. With autogr. envelope. To Grete. With autogr. draft reply from Grete (½ p). 7) ALS. Undated. 4 pp. on bifolium. 8vo. To Grete. 8) ALS. Undated. 3 pp. on bifolium. 8vo. To Grete. - Grete Kliem: 1) Autograph letter draft signed. Undated. 2 pp. Oblong small 4to. To Georg. 2) Autograph letter draft signed. Undated. 1½ pp. Large 8vo. On headed paper of Fa. Beyersmann, Hagen i. W. To Georg. 3) Autograph letter draft signed. Undated. 1 p. Small 4to. To Georg. - Lisabeth: 1) ALS. 20 Oct. 1920. 4 pp. on bifolium. 4to. To Grete. 2) ALS. 22 Oct. 1920. 2 pp. 4to. To Grete. 3) ALS. Ilsenburg, 27 Gilbhard [October] 1920. 2 pp. Large 4to. To Grete. 4) ALS. 6 Dec. 1920. 2 pp. 4to. To Grete. 5) ALS. 21 Jan. 1922. 4 pp. on bifolium. 4to. To Grete. - 6) ALS. Undated. 4 pp. on 2 ff. Small 4to. - Includes: 1) Postcard by various undersigners to Hilde Lange, sending congratulations on her betrothal. 2) Addressed envelope from Georg Benjamin to his fiancée..